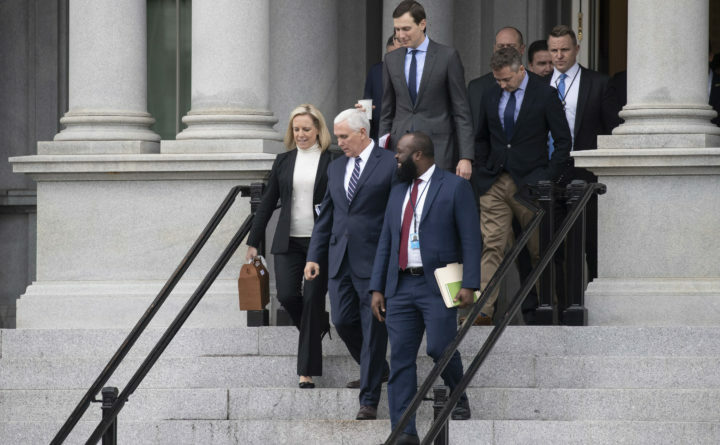 Homeland Security Secretary Kirstjen Nielsen, left, Vice President Mike Pence, White House legislative affairs aide Ja'Ron Smith, followed by White House Senior Adviser Jared Kushner, and others, walk down the steps of the Eisenhower Executive Office building, on the White House complex, after a meeting with staff members of House and Senate leadership on Saturday in Washington. With the talks stalled, House Speaker Nancy Pelosi, D-California, said House Democrats intend to start passing individual bills to reopen agencies. The first would be the Treasury Department, to ensure people receive their tax refunds. “Not much headway made today,” Trump tweeted Saturday after receiving a briefing from the team led by Vice President Mike Pence.